What is a Radiant Heater and When Should You Use One? Unless you are a specialist working in the HVAC (Heating, Ventilation and Air Conditioning) industry, there is a good chance you may have never stopped to give the matter of different heater types much thought. For instance, did you know there are two main types of heaters? Did you know that the type of space you are trying to heat should very much influence the type of heater you select? In this post, we will take a closer look at what a radiant heater is, how it works and the types of spaces in which it is likely to work best. By the end of this post you should be able to identify whether a radiant heater might be the best choice for you. Much like it sounds, "radiant" heat is simply heat that radiates out from a central source - in this case, from a radiant heater unit. To truly understand how a radiant heater works, it can help to do a comparison with its more recently developed counterpart, the convection heater. Radiant heater. A radiant heater generates heat internally and radiates that heat to nearby persons and objects. Convection heater. A convection heater uses an internal mechanism (usually a fan or blower) to blow heated air into a room until it raises the temperature of the air in the whole room. The majority of heaters being sold today are convection type heaters, including the smaller space heaters that are used in many rooms and offices. Typically convection heaters operate from a centrally located main unit and a series of ducts through which the warm air can be blown to the farthest corners of each room. Choosing the type of heater to install can be made most easily when you understand where each heater type works best. Matching the correct heater with the space can help you realize savings on your utility bill and also provide better air quality for your family. Convection heaters tend to be a good choice in enclosed spaces. This is because of how convection heaters work. The heated air is blown into the space until all the air in the room has been heated to the desired temperature. Because the space itself is closed, the air will stay warm for longer. This holds true whether the space being heated is larger or smaller. So long as it is enclosed in some way so the heated air stays in the room and doesn't routinely encounter colder air from drafts, etc, a convection heater can be an energy-efficient choice. A radiant heater, on the other hand, will work much more efficiently when it is placed in areas near to the people or objects that need to stay warm. Here, it doesn't matter as much if the room is open or enclosed, since it is the individual persons or objects that are being heated rather than the air itself. Also, since radiant heaters don't rely on blown air to heat a space and thus will cause no drafts, they can be real health-savers for people who suffer from allergies, asthma or other breathing-related issues. Finally, radiant heaters tend to be ideal choices for rooms that serve a specific purpose, are smaller in size and may go unused for long periods of time during the day or night. Bathrooms and bedrooms are good indoor examples of this type of room. Basements, garages, storage sheds that need to be temperature controlled, patios and workshops are also all good examples of rooms where radiant heat can be an excellent, energy efficient choice. Wall mounted radiant heaters. Wall mounted radiant heaters are a newer addition to the marketplace and have certain advantages, chief among which is that they take up no floor space and are slim. They also offer radiant heat that is more balanced from head to toe (if you have ever stood or sat near a radiant floor heater and had your feet get very hot, you already know all about this effect). Safety-wise, wall mounted radiant heaters are also much better for homes that include small children and/or pets. Permanent floor radiant heaters. 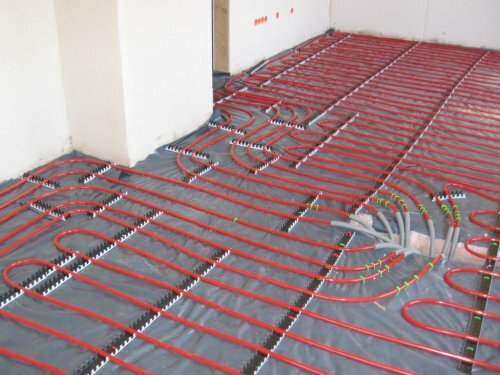 Here, the radiant heat system is installed directly underneath the floor surface. One very common application for this type of model is in the bathroom, where tiles can get cold to the point of discomfort in winter. Permanent ceiling radiant heaters. Here, the radiant heat panels are installed in the ceiling, which then radiates heat out towards items and persons beneath. Free-standing floor space heaters. Free-standing floor space radiant heater models tend to be smaller than their wall mounted cousins and can be easily moved from room to room, which can be a real advantage if your only option is to take your heat with you. They are also ideal for providing heat in very small spaces. An additional hybrid type of radiant heater includes a convection element to generate heat through both heated air flow and heating nearby individuals or objects. So long as you match the type of space correctly with a radiant heating system, you will enjoy a system that makes efficient use of energy, provides a quick heat source and can be individually controlled for each room as needed.